The Pike County Sheriff's Office charged the family on accusations they planned and carried out the murders of the Rhoden family in April of 2016. Ohio authorities arrested three generations of a family on Tuesday in connection with the execution-style murder of eight members of another family on a marijuana farm in 2016. Parents George "Billy" Wagner III, 47, and Angela Wagner, 48, and their two sons, George Wagner IV, 27, and Edward "Jake" Wagner, 26, were arrested by the Pike County Sheriff's Office on accusations they planned and carried out the murders of eight members of the Rhoden family in April of 2016. The Rhodens were found massacred on their family property, where authorities found evidence of marijuana "grow operations." The crimes occurred in three mobile homes on Union Hill Road and at another home a few miles away, a spokesperson from the attorney general's office told NBC News. The Wagners were indicted by a grand jury on more than 80 criminal counts, including eight counts each of aggravated murder with death penalty specifications, authorities announced at a Tuesday afternoon news conference. Prosecutors said that the Wagners were "meticulous" in plotting the deaths of the Rhoden family and covering their tracks. Officials would not provide details on a possible motive for the killings but allege that a custody battle played a part. All of the Wagners were also charged with forgery of a custody document and tampering with evidence, according to the indictment. In addition, Angela Wagner's 65-year-old mother, Rita Newcomb, and Billy Wagner's 76-year-old mother, Fredericka Wagner, are each facing obstruction of justice and perjury charges for allegedly misleading investigators. Newcomb was additionally charged with forgery. "They did this quickly, coldly, calmly and very carefully — but not carefully enough," Pike County Sheriff Charles S. Reader told reporters. "They left traces, they left a trail — the parts to build a silencer, the forged documents, the cameras, cell phones, all that they tampered with. And the lies, all the lies they told us." The victims were identified as Hannah Gilley, 20; Christopher Rhoden, Sr., 40; Christopher Rhoden, Jr., 16; Clarence "Frankie" Rhoden, 20; Dana Rhoden, 37; Gary Rhoden, 38; Hanna Rhoden, 19; and Kenneth Rhoden, 44. A 4-day-old, a 6-month-old and a 3-year-old survived, officials said. Jake Wagner was a long-time former boyfriend of victim Hanna Rhoden and shared custody of their daughter, Sophia, at the time of the massacre. Sophia, now 5 years old, was not present at the crime scenes in 2016. Wagner was also charged with unlawful sexual conduct with a minor, for allegedly having a relationship with Rhoden when she was 15 and he was 20, according to the indictment. Ohio Attorney General Mike DeWine, now governor-elect, said that the case involved an "obsession" with custody and control. The Rhodens were found dead in four separate homes on the farm. 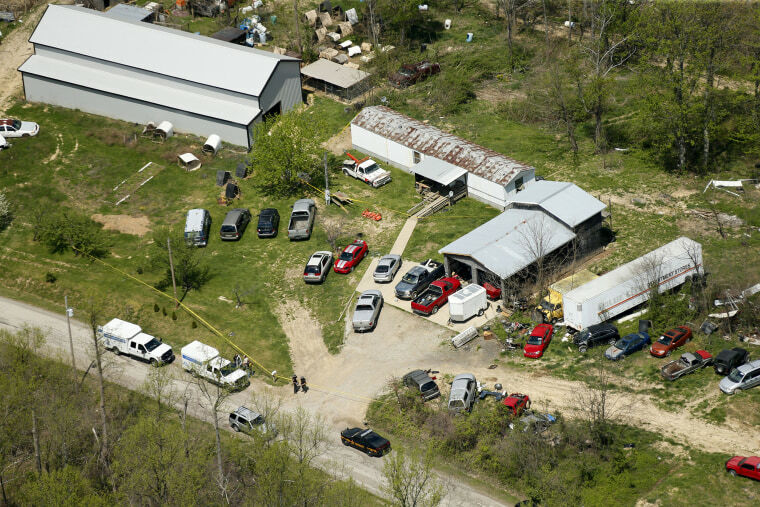 Autopsies from the Pike County Medical Examiner showed that all eight victims died of gunshots wounds and evidence of a struggle. Some of the victims had shown soft tissue bruising, indicating that they fought their killer or killers, according to the medical examiner's report. While searching the crime scenes, officials found that one of the grow operation was comprised of more than 100 marijuana plants. DeWine would not say whether the drugs played a central part in the motive, only noting that the drugs were an "undercurrent" in the case. DeWine said at the time the said the murders were a "pre-planned execution." Authorities have yet to give a suspected motive for the killings.